The LGBT Chamber of Commerce of Illinois & DePaul University are partnering to help further the Chamber’s mission to promote the LGBT community & provide resources to develop LGBT Employee Resource Groups (ERG’s) throughout the Chicago area. 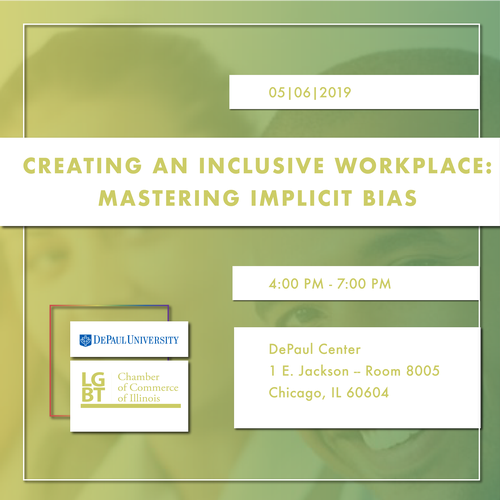 Veronica S. Appleton, an Adjunct Professor from DePaul University’s College of Communication will review the constructs & best practices in mitigating bias in the workplace. In addition to teaching courses in both intercultural & organizational communications at DePaul – she is also the Assistant Director of Diversity & Inclusion for We Are Unlimited. Inclusion is at the heart of an organization. Come and receive tips, best practices in building stronger teams & how to create a diverse workplace comprised of the world we live in today. Light appetizers will be served.